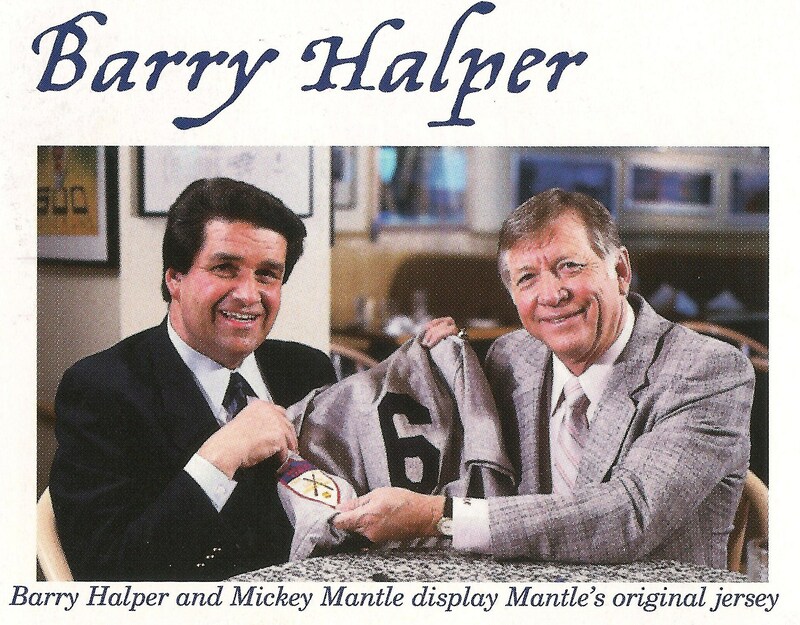 Barry Halper even fooled "The Mick" with his alleged #6 1951 Mantle rookie jersey. This photo and graphic appeared in the Baseball Hall of Fame's official tourist brochure for the 1999-2001 Barry Halper Gallery. The jersey pictured was a forgery purchased by MLB and later returned to Halper by the Hall of Fame. After Halper's death it was sold in 2007 by REA as a "replica." 2010 unleashed a host of investigative reports that blew the lid off long-standing hobby frauds and hoaxes that had been covered up for decades. Haulsofshame.com reported on controversial issues that the press ignored and refused to tackle themselves. The reports published resulted in: the Baseball Hall of Fame admitting their alleged “Shoeless Joe” Jackson jersey was a fake; the exposure of Barry Halper and Al Stump as the perpetrators of frauds; the confirmation that the National Baseball Library, the New York Public Library and the Archives of Hawaii were victimized in massive thefts; and that Baseball power-brokers like Bud Selig and Jane Forbes Clark were swindled by one of their own. When Haulsofshame.com first launched this past Spring, we had a few thousand unique visitors for the month of April. By November we were averaging over 15,000 visitors per month and by the new year, the visits are fast approaching the 20,000 mark. Special thanks go out to all of our readers for their continued support. 2. SABR’s Ron Cobb Exposes Al Stump’s Relic and Literary Fraud Against Ty Cobb . Barry Halper’s Infamous Cobb Shotgun Uncovered as a Fake. 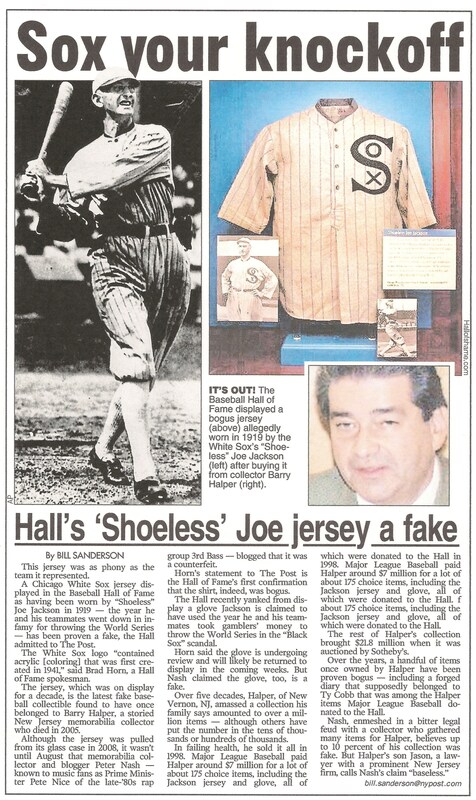 After Haulsofshame.com published a report claiming that the HOFs alleged 1919 "Shoeless Joe" Jackson jersey was a fake, the NY POST, on Oct. 4, 2010, (above) reported that the Hall of Fame admitted the jersey was fraudulent. Your persistance has resulted in a year of exposes without parallel in baseball history. Congratulations on your careful work and on presenting it to all of us concerned about our national game. What you have uncovered is amazing. Innocent people have been saved from buying stolen items and fake items. Things aren’t looking good for crooks and thieves in 2011! Looking forward to more reports in 2011! What a wonderful debut year it was for HOS! Kudos to you, Peter, for exposing the dirty side of what is supposed to be a “fun” hobby. This website should be nominated for awards! Thanks so much for all of your investigative efforts and for making it all public on this most informative website. I truly hope that interest and readership continue to grow and that your efforts help bring more of these missing national treasures to their rightful resting places!